This reissued collection was published orginally in 1963. Its cover blurb predictably tells us that it shows 'the richness of English poetry'; fair enough, as long as you don't think women had much to do with rich English poetry - 58 out of the 64 poets represented are men. 'Richness of English poetry' also excludes other cultures and, given its date, most of the currently popular poets for children. But there are also many good things about this anthology. Blishen selects some lesser known poets, such as Adelaide O'Keefe who was one of the 'young persons' writing in the Taylor sisters' seminal collection of 1804, Original Poems for Infant Minds (The Pig is not a feeder nice, / The Squirrel loves a nut, / The Wolf would eat you in a trice, / The Buzzard's eyes are shut). Dorothy Wordsworth's 'Address to a Child during a Boisterous Winter Evening' is also there as is Christopher Smart's wonderful 'My Cat Jeoffry' (not usually selected for children) which was written in the eighteenth century, plus poets from an earlier time like Ben Jonson, Robert Herrick and William Shakespeare, of course. 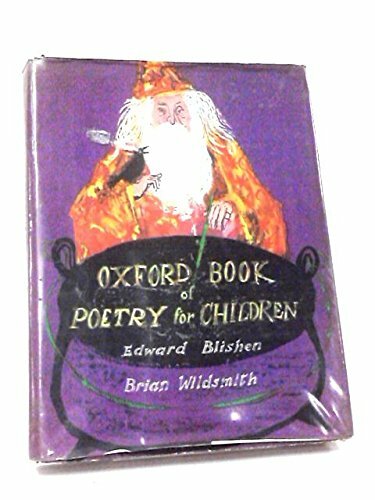 The 'greats' who wrote directly for children are there, too - William Blake, Christina Rossetti, Edward Lear, Lewis Carroll, R L Stevenson, Walter de la Mare et al, plus lively examples from the oral tradition. Like many other editors, Blishen favours narrative and lyric poetry, so there are plenty of well known ballads and many long poems in conventional metre; free verse there is not! But if you want an anthology of traditional poetry, this is one of the best on the market. It also has the bonus of artwork by Brian Wildsmith in vibrant form.